Healthcare providers and imaging centers are taking steps to optimize the radiation dose and educate patients about the risks and benefits of nuclear medicine and PET procedures. Accurate Standardized Uptake Values (SUV) and advanced molecular imaging studies involving quantitative imaging procedures mandate accurate patient dose reporting. Imaging departments are faced with an increasing patient workload with reduced resources. It is imperative that technologists, managers and physicians work efficiently, as a team and communicate to provide effective patient care. 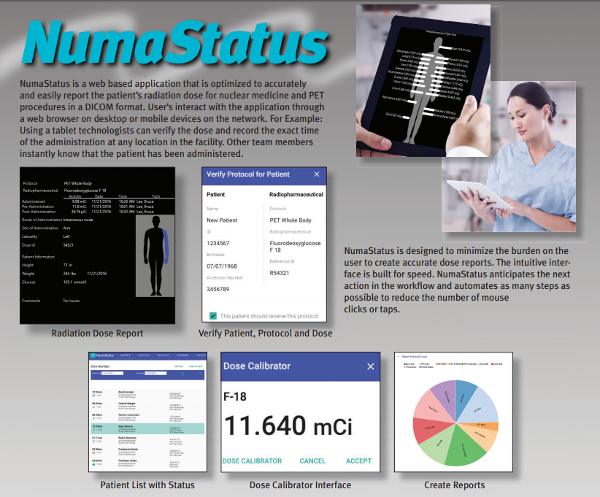 Thus, Numa initiated a new product called NumaStatus that supports the DICOM specifications required to record and share this essential information. NumaStatus is designed to minimize the user’s requirements to create the radiopharmaceutical dose report and provide value by instantly updating the status of the patient’s visit to all team members. NumaStatus is a web based application that is optimized to accurately and easily report the patient’s radiation dose for nuclear medicine and PET procedures in a DICOM format. User’s interact with the application through a web browser on desktop or mobile devices on the network. For Example: Using a tablet technologists can verify the dose and record the exact time of the administration at any location in the facility. Other team members instantly know that the patient has been administered. NumaStatus is designed to minimize the burden on the user to create accurate dose reports. The intuitive interface is built for speed. NumaStatus anticipates the next action in the workflow and automates as many steps as possible to reduce the number of mouse clicks or taps.